Nonfiction animal books are in high demand in my elementary library. I find that many children love to check out books about pandas, cheetahs, sharks and various other animals for pleasure reading. Wild animals also seem to be the preferred topic to introduce younger students to the research process. Teachers assign animals for research because they're of high interest, and there are endless online and print resources for the K-5 crowd. I recently read two new books about manatees that will thrill the young readers and researchers in my library. The first thing I noticed about Manatee Calves is that the size of the book is perfect for small hands. 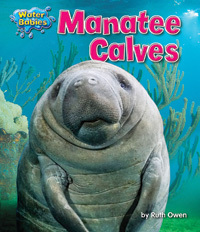 Upon opening the book, the clear underwater photos of manatees and their calves caught my attention. The information is organized by topic: food, where manatee calves live, and daily life to name a few. The text is large and spaced nicely for newly independent readers. Teachers will be pleased that the series incorporates text features (captions, maps, a glossary and index) that will aid children in understanding new information. Other topics in the series include sea otter pups, penguin chicks, and seahorse fry. Children's Press has released updated and new titles in the Nature's Children series. We own oodles of the old Nature's Children books in my K-5 school library, so I was interested to see how the new books in the series compared. Manatees is organized into five chapters. Each two page spread includes one full-page photograph and a page of text. 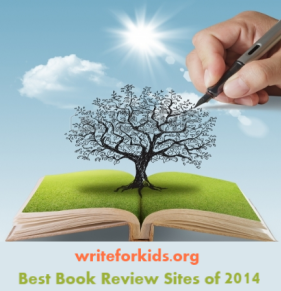 The information is presented in the traditional expository form, yet the writing is not dull. The author's use of descriptive language will hold the attention of readers. "Manatees slowly move their bulky, oval-shaped bodies through shallow water as they search for their next meal. Like actual cows, manatees are herbivores. This means they feed only on plants." 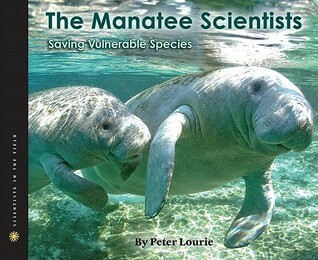 Chapters near the end of the book focus on dangers manatees face and ways in which the public may help them avoid extinction. Readers will enjoy reading the fun facts included at the bottom of several pages. Vocabulary words are printed in red and correspond to a glossary in the back of the book. The print in the book is fairly small, and there is a lot of text on a page which makes this a book for a strong elementary school reader. 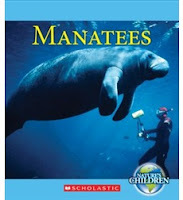 By visiting a site listed in the back of the book (www.factsfornow.scholastic.com) and typing in "manatees," readers are presented with a list of related articles from Groliers Online. This could prove useful for students working on research projects for school. Middle school students in search of information about manatees should check out The Manatee Scientists: Saving Vulnerable Species by Peter Lourie. It's part of the Scientists in the Field series, and it's fantastic! We own all Bearport's baby animal series and they are very, very popular with our easy reader crowd.